Rainwater is the best type of water to use on houseplants. 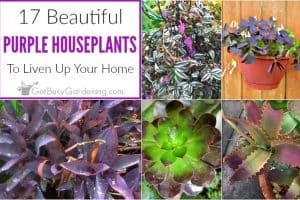 In the summer, I use the water from my rain barrels and my houseplants love it. Unfortunately, during the winter the water in my rain barrels would be frozen solid if I left them outside here in MN. So, as an alternative to using rainwater, I melt snow during the winter to use for watering my houseplants. 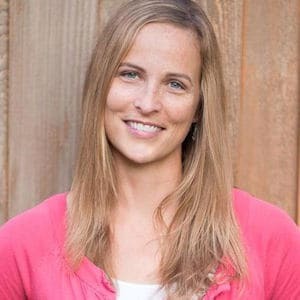 Well, guess what – melted snow water is good for plants too! In fact, it’s just as good as using rainwater. 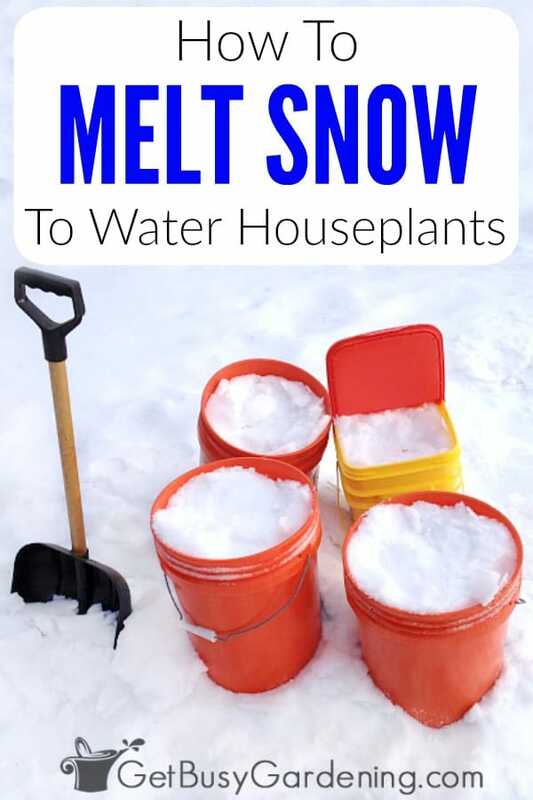 You can use melted snow to water plants just like you would use any other type of water. 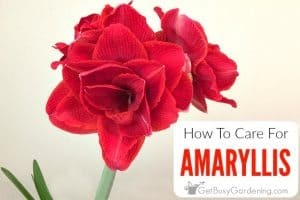 But, it’s super important to remember that icy water can be harmful to indoor plants. So, before watering plants with melted snow, the water must be warmed to room temperature. It can take several days for snow water to warm up, so be sure to allow enough time for that. Step 1: Find some clean snow – Make sure you collect the cleanest snow you can. I go out into my backyard where the snow is pretty much undisturbed (steer clear of rabbit and other animal turds). Also, don’t collect snow that is located near the street, a driveway, or a sidewalk where salt or ice melt was used. These chemicals will harm your houseplants. Step 2: Pack the snow into your buckets – Use your shovel to fill your buckets with as much snow as you can. 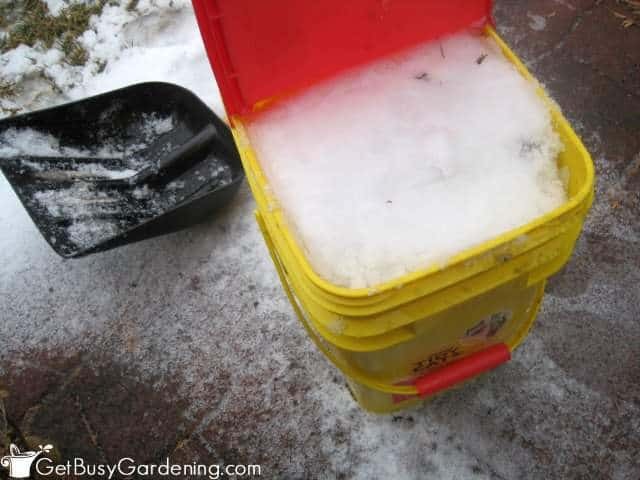 As you fill the buckets, pack the snow in as tightly as you can. The more snow you can fit into the bucket, the more water you’ll get. 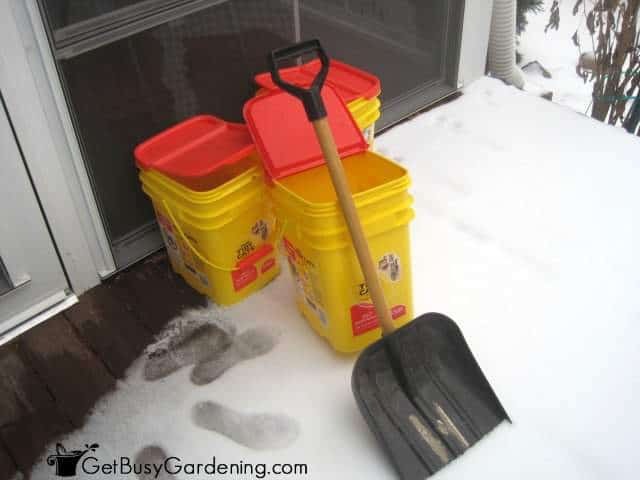 Step 3: Allow the snow to melt – Once your buckets are full, bring them into the house to let the snow melt. It takes longer than you would expect for the snow to melt, so plan ahead. For a 5 gallon bucket of snow, it takes about two days to melt completely. 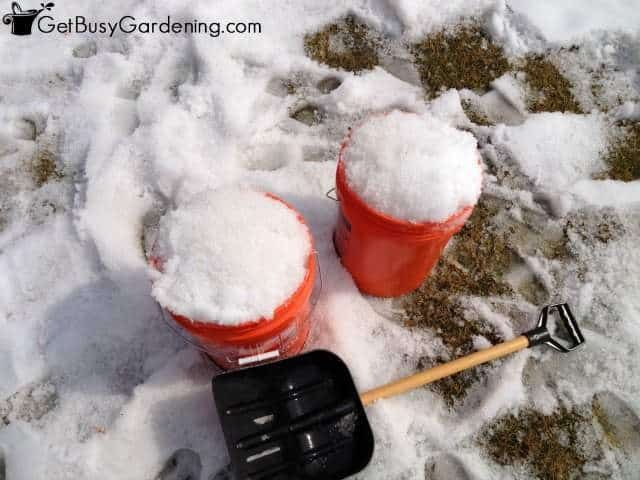 Putting your buckets of snow in a warm room will speed up the melting process. Step 4: Prepare to transfer the snow water – After the snow has melted, it’s time to transfer the water into your watering can or jugs. This part is a little tricky to do by yourself, so you might need someone to help until you get the hang of it. Make sure to lay down some old towels, or do this in the bathtub juuuust in case you end up spilling water all over the floor (I’m speaking from experience here… ehem). Step 5: Strain the water – There will likely be some debris in your melted snow, so you’ll want to filter that out. Lay the strainer over the top of the large funnel. 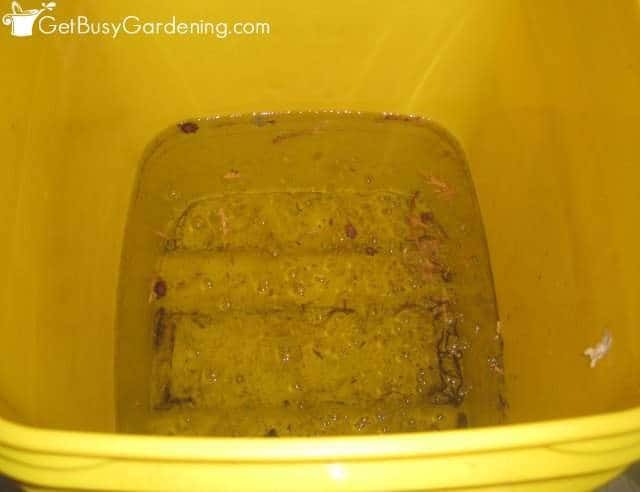 Then slowly pour the water out of the bucket into your storage container. This can be a bit of a balancing act (you should have seen me trying to take these pictures!). 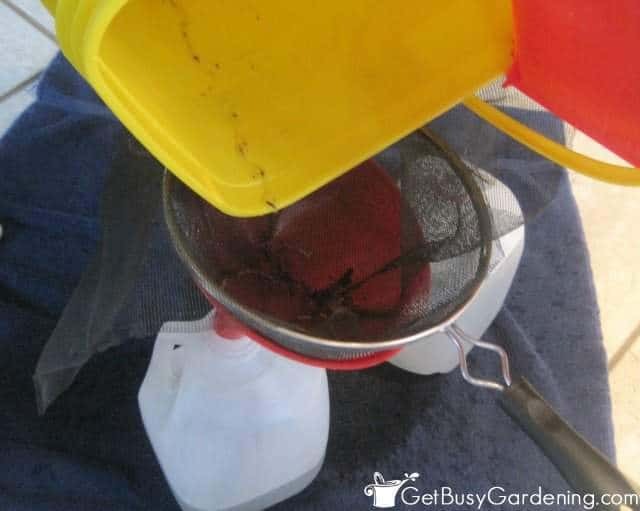 So you may find it easier to strain the water into another large bucket first, then pour it into your watering can later. When I fill my 5 gallon buckets with light, fluffy snow I get less water than I do when I fill them with heavy, wet snow. That makes sense right, since heavy snow holds more water. 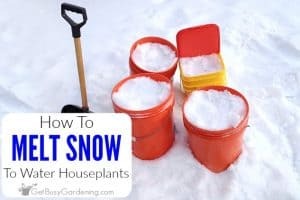 So, if you want to get the maximum amount of water for your efforts, then collect snow to water indoor plants after a heavy snowfall. To give you an idea of yield… with lighter snow, three 5 gallon buckets of snow yielded almost six gallons of water. Not too bad. After a heavy, slushy snowfall, these same three buckets yielded eleven and a half gallons of water. That’s much better! As I mentioned before, I store the water I get from melting snow in plastic jugs, but you can use any type of watering can you have. I try to keep my watering jugs full at all times. So, after I water my plants with melted snow, I collect more snow to fill the jugs again. That way I always have room temperature water for my houseplants on hand when I need it. Melting snow to water plants is more work than simply using tap water. 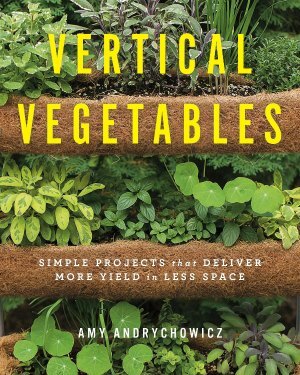 But, it’s really not that much more work – and it’s SO much better for the plants! It takes me less than ten minutes to collect the snow, and then another 5-10 minutes to pour it into my watering jugs. Although, this is another one of those things I do where I’m pretty sure my neighbors are rolling their eyes and laughing at me. But it’s worth it; I have extremely healthy houseplants! Do you struggle to keep your houseplants alive and thriving during the long winter months? Then you need to buy my Winter Houseplant Care eBook. 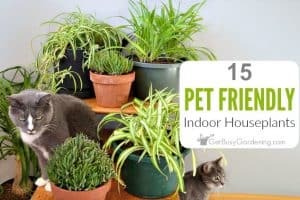 It has everything you need in order to keep your houseplants healthy all year long. Download your copy today! Share your tips for collecting and using snow for watering indoor plants in the comments section below. Okay Amy, this is one of those "why didn't I think of that!" moments! Lord knows I have enough cat litter bins around my place too! I'm so good about giving my plants rainwater all summer but then winter comes and the houseplants get our tap water which is quite high in iron and who knows what else. Thanks for sharing! Hmmm, I wish it yielded more water. But, still, a good idea! I agree. But once I knew how much water to expect after the buckets of snow melted, it wasn't so bad. I only use about 10 gallons each time I water my plants… and I don't water them very often during the winter. Great idea! I wonder how long you could keep this water. 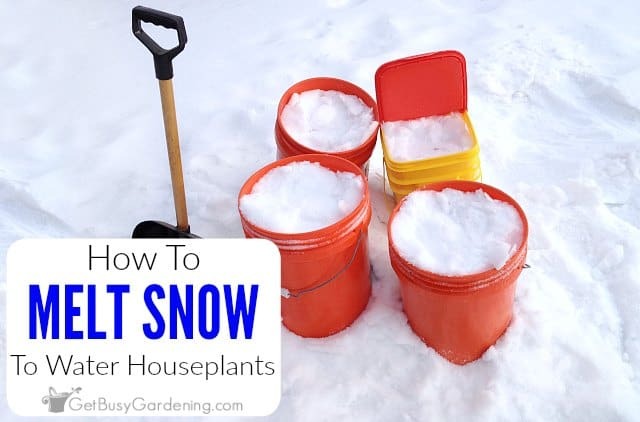 “Harvest” snow in winter and store it to water the garden during a dry stretch in the summer. I was recently lamenting the mountains of snow in the backyard and thinking, come August, when it’s hot and dry I will be wishing for some of this water that’s just sitting there! You should consider getting a couple of rain barrels. That way, you could fill them up with snow in the spring, and then use them to capture rainwater in the summer too. You can use the same 5 gallon buckets to collect rain water in the summer also. Now, if its a heavy rain i wait 10 minutes before putting them out. That way a lot of the pollen and dirt debris on your roof will have been washed away already. You can tell when its good water, its very clear. If you get a lot of snow, id take the first few inches off the top, and use whats in-between. Try to avoid snowbank snow, it usually has so much mystery debris its not worth the trouble. Great tip! I have a couple of rain barrels that I use to collect water, love them! I use rainwater and melt snow too. The plants are way healthier. My neighbors probably think I am a kook but my houseplants love me! The last few years I have been trading out my tropicals for edibles. Now I nibble on my houseplants. When temps warm up, I shovel a ton of snow into my 32 gallon trash bins so it can melt in there to use over the summer. This means that if the year is a bit dryer, I still have a good supply of water to use.